If I see a dipper, I stop to watch it. 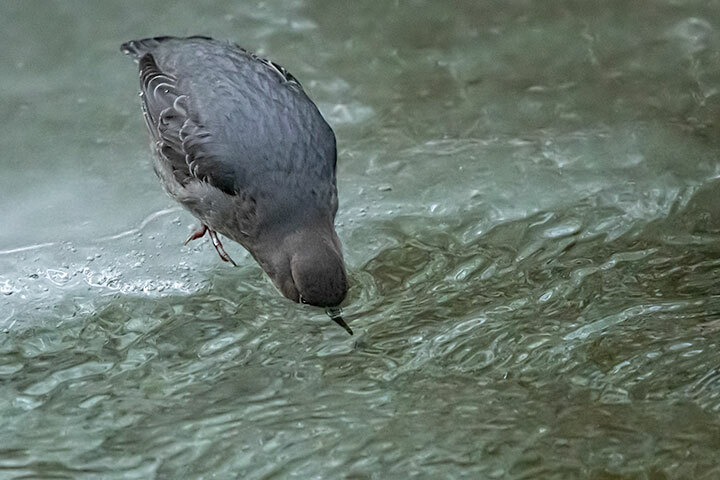 Yesterday, I was watching a dipper dive from the border ice along the frigid waters of a creek where it hunted along the creek bed for things to eat. Standing beside me was a lad who chatted about the amazing feats of this small bird and opined that it would walk along the creek bed as it searched for things to eat. The problem is that knowing just what this bird is doing underwater lay unresolved for a long time. Underwater dives happen rather quickly, and at uncertain locations. Further, surface waves and light reflections typically obscure any view from above. So, does the dipper walk along the bottom as it forages, or does it use its wings to fly underwater? Curiously, this was a topic of some debate for decades during the twentieth century. Because the dipper can float, it seemed unlikely that it could walk along the bottom, but using its wings to fly underwater, as if in the air, seemed somewhat implausible. Careful observation finally settled the issue: It flies under water (although it occasionally will use its feet against the bottom to propel itself forward). However, knowing that a dipper uses its wings to fly underwater, and being able to watch it do so, are two different things. 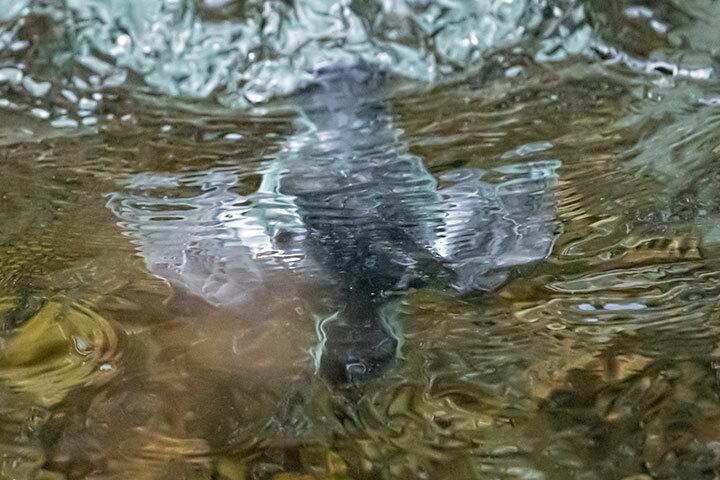 Only once before, a half-dozen years ago, did I managed a good shot of a dipper flying underwater. Today I managed rather so-so shot. A dipper sits on border ice and peers into the waters of the creek before diving in. When it dives, it has its wings tucked in so as to cut cleanly into the water. A moment later, it has spread its wings and begins to fly underwater. Its head is tipped down as it scours the bottom for comestibles. AMAZING!!! Great photography Allistair…..the wonders of digital photo, what? Stu, many times I have tried and failed, so even with digital photography, getting this shot was not a slam dunk. 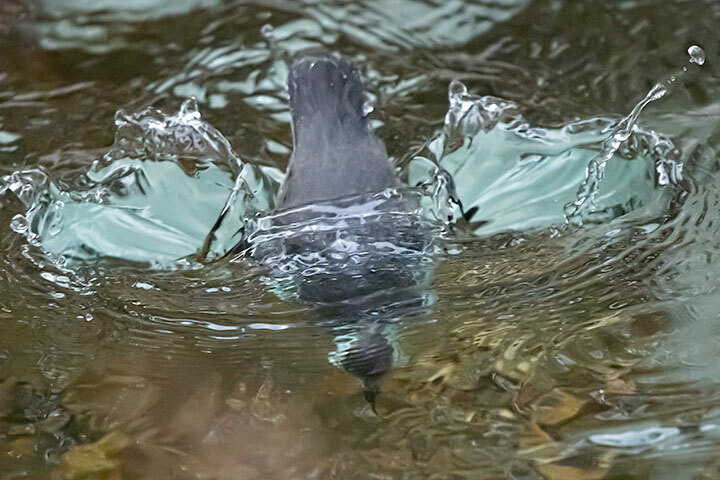 Really interesting about the dipper flying under water. Good photos too. The colours are interesting too. Where do the splashes of cyan colour in the centre image come from? The shape resembles wings, but as I look closer, I see the same shade on top of the water in the first image and partially outlining the dipper and behind it on the last image. If this is mirroring the sky, why would it appear to wrap around the dipper under water? Tom, the creek is lined with trees through which skylight can be seen. Depending upon the tip of the disturbed surface waters, the transmission of underwater colours combined with overhead darkness and skylight might have produced these shades. There’s a Dipper’s nest under a bridge at Goldstream Park outside Victoria. The birds forage for salmon eggs. It’s hard to follow them once they’re under the water.